This was the sport of kings, all over Europe, for centuries. In the past, it consisted of chasing a hapless animal–fox, deer or boar–across open countryside. Riders on horseback follow a pack of baying hounds, jumping fences and ditches. 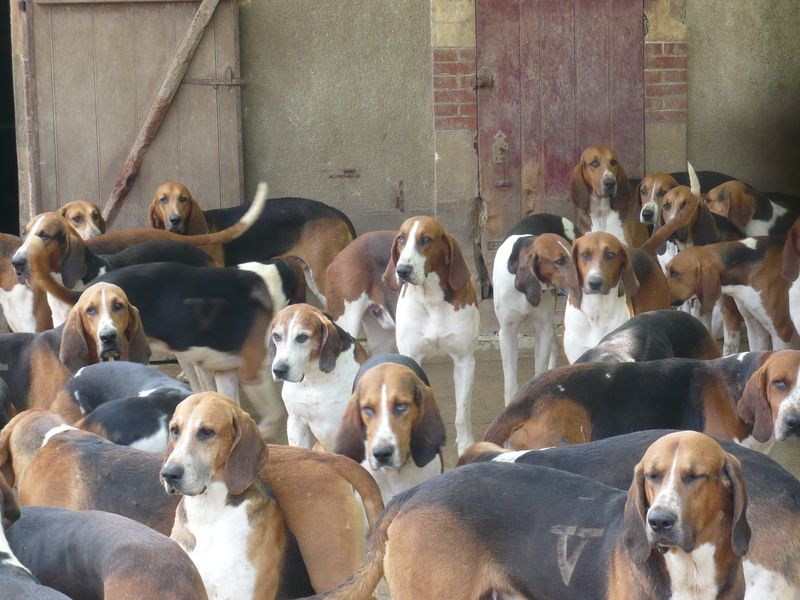 People who subscribe to the hunt say that the baying of the hounds is like beautiful music. In the past, the hunted animal might be cornered and attacked by the dogs. I didn’t see any information at the castle about how modern hunting is actually done, but I’ve been told that it is much more humane these days and follows local regulations. And of course it is necessary to control the wildlife population. 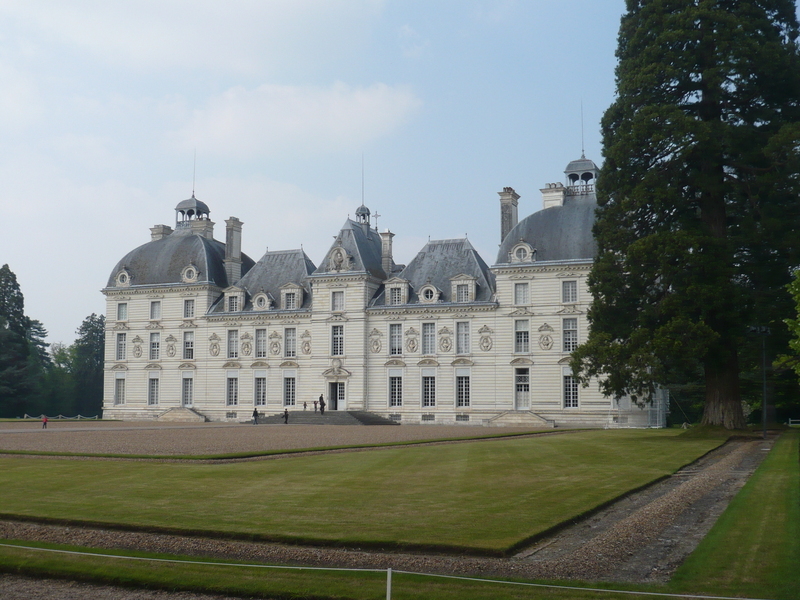 One of the main attractions at Cheverny is the daily feeding of the hounds. 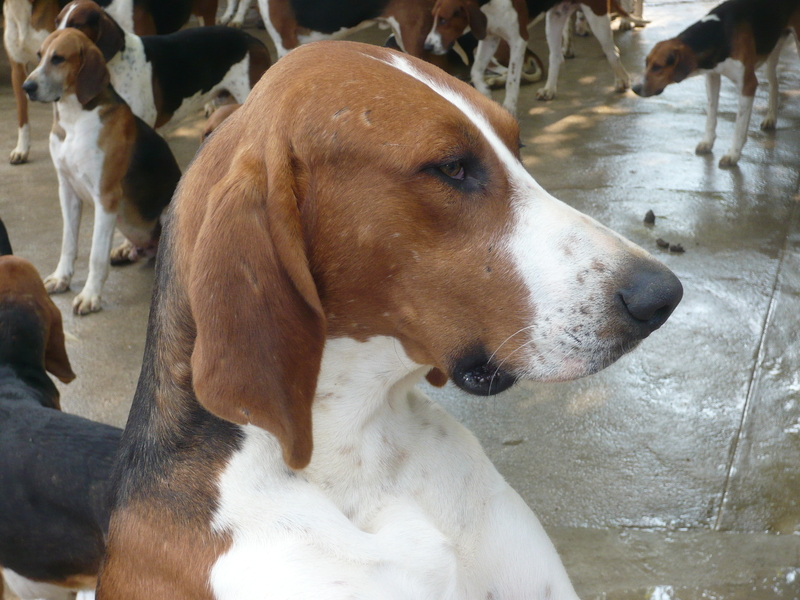 The dogs are a combination of English foxhound and French Poitou. Their dinner, “la soupe des chiens,” always attracts a crowd. The hungry hounds mill around in their kennel, baying and yelping, when they know it’s almost time. Their lab-coated trainer hauls in big troughs of raw meat, topped with kibble, and places it all on the floor, which has been hosed down beforehand. The trainer lets the dogs into the feeding area, barking and jockeying for position–but they have to wait! They are perfectly trained. They stand inches away from the food, until they get the signal to eat. Then they leap forward, crowding and snapping, and devour it all within a few minutes. This kind of strict training must be essential for hunting, which I understand they do twice a week. Clearly these hounds live to hunt. I can imagine their joy when they’re set loose in the woods. I revisited Cheverny in 2018 and missed the feeding, but saw the dogs and one of their keepers, who spoke in a friendly way with visitors while cleaning their enclosure. My French is not great so I didn’t quite understand the conversation. I noticed a new sign explaining the feeding and sanitation for the hounds–I need to translate it. I’d like to have asked the kennel man whether there’s a retirement program for dogs too old to run with the pack. I have a feeling there must be. They are clearly loved and cared for. I’d like to think this handsome fellow, photographed on my visit a few years ago, is enjoying his golden years on somebody’s sofa–with his very own food dish beside him. This entry was posted in British Isles, England, France, Germany and tagged "la soupe des chiens", Chateau de Cheverny, Cheverny hounds, fox hunting in England, riding to hounds on May 23, 2014 by Claudia Suzan Carley.